SUNY Oswego online broadcasting student Joely Rice juggles schoolwork with gathering fame and followers across social media for her daily Joely Live show on video app TikTok and weekly #PhotoshootWithJoelyLive on the app. The latter involves traveling to do popup photo shoots with young girls to share a message of empowerment and self-confidence -- including this stop locally at the CNY Gymnastics Center in Syracuse. OSWEGO — Like many college students, SUNY Oswego online broadcasting major Joely Rice works hard to stay up to date while juggling other responsibilities. SUNY Oswego online broadcasting student Joely Rice juggles schoolwork with gathering fame and followers across social media for her daily Joely Live show on video app TikTok and weekly #PhotoshootWithJoelyLive on the app. 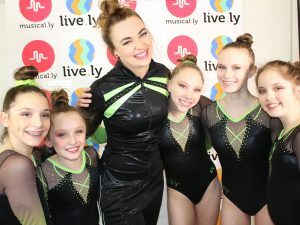 The latter involves traveling to do popup photo shoots with young girls to share a message of empowerment and self-confidence — including this stop locally at the CNY Gymnastics Center in Syracuse. For her, this includes running a daily advice show to a wide audience on the TikTok app and traveling the world to hold photo shoots empowering young girls. Known to nearly 300,000 TikTok fans, more than 23,000 Instagram followers and sizable Snapchat and YouTube audiences as Joely Live (@joelylive), Rice also is represented by top modeling agency IMG Models — all while maintaining a 4.0 at Oswego. Most of her audience, between the ages of 8 and 17, comes from across North America, Europe, South America and Asia (where the app started). While building an audience and offering advice proved rewarding, she took things a step further by pitching a weekly #PhotoshootWithJoelyLive show to the app. Her dreams coalesced from conversations a young Rice had with her own mother. “Growing up I would talk to my mom at night, and I remember just telling her that I want to be inspiring to girls and boys from around the world. So many nights I would dream about what I could do to make this happen,” Rice said. She credits one of the college’s most famous alumni with her choosing SUNY Oswego. Rice met NBC “Today” show co-host Al Roker in an airport while she was flying to Mexico, months away from earning her associate’s degree from Tompkins Cortland Community College. “He was so nice, humble, and I remembered that Roker went to Oswego, which inspired me then to follow in his footsteps,” Rice said. Given her schedule, the online bachelor’s in broadcasting was a perfect match. Rice became a model at age 5, almost unintentionally. Her 9-year-old sister wanted to be a model, and “my mom decided if we were going to take four-hour car rides from Upstate New York to New York City that we might as well both get into it,” Rice recalled. This set the tone for her ambitions. Vogue is among the places for which she has modeled, as well as the likes of Target, Children’s Place, Tommy Hilfiger and Ralph Lauren, among many others. When she was 10, she applied for and won a Sports Illustrated Kids Reporter contest to work for the publishing giant for a year. “To me, it sounded like a dream,” Rice remembered. She got to meet and interview retired New York Giants lineman and Super Bowl champion Rich Seubert, and their families still spend some time in the summers together. Rice also fondly recalled interviewing Robin Meade, anchor for CNN’s Headline News Network, in Atlanta.